This is the first game in the Naruto: Clash of Ninja series. For other games in the series see the Naruto: Clash of Ninja category. Naruto: Clash of Ninja (NARUTO -ナルト- 激闘忍者大戦!, Naruto: Gekitō Ninja Taisen?, lit. "Naruto: Great Ninja Battle") is a 3D cel-shaded fighting game developed by Eighting and published by D3Publisher and Tomy. 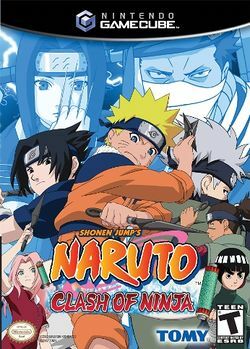 It is based on the popular anime and manga series Naruto by Masashi Kishimoto, and the first installment of the Naruto: Clash of Ninja video game series. In the game, players pit two characters from the Naruto manga and anime series against each other, using basic attacks and special techniques to defeat their opponent in one of the game's modes. Clash of Ninja was originally released in Japan on April 11, 2003, and the game was subsequently released in North America on March 7, 2006, with the only major difference being the voice-overs by the English voice actors from the Naruto anime. Critical opinions of the game have been mixed, with many praising the simple and easy-to-learn fighting system, while others lambast the fighting system, and the lack of significant unlockable content. Over the course of the game, the player controls one of a select few characters directly based upon their counterparts in the Naruto anime and manga. Clash of Ninja is a member of the fighting game genre; the player pits their character against another character controlled by the game's AI or by another player, depending on the mode that the player is in. The objective is to reduce the opponent's health to zero using basic attacks and special techniques unique to each character that are derived from techniques they use in the anime/manga. For instance, Naruto Uzumaki is able to use his signature Shadow Clone Technique, and Rock Lee utilizes many of his Strong Fist style techniques. To use these techniques, characters have available a chakra bar, which depletes upon the execution of a special technique, and regenerates over time. In the game's numerous modes, the player can choose from different styles of play. The game's story mode follows the plot from the anime and manga, and a versus mode pitting two players against each other also included. This page was last edited on 1 May 2012, at 18:16.